Matthew Apgar - mapgar@shawmedia.com Students practice archery at Johnsburg Middle School on Tuesday, March 01, 2016 in Johnsburg. 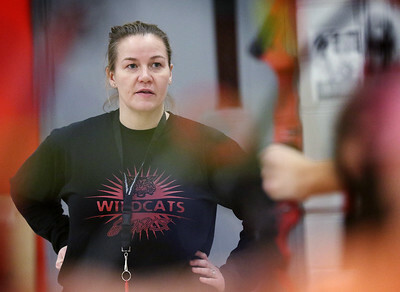 Their coach, Erin Hiller, was given a $3,500 grant from Safari Club International to begin an archery program at the school and will be headed to their second tournament this weekend at Chula Vista in the Wisconsin Dells. Matthew Apgar - mapgar@shawmedia.com Nicholas Baird practices archery after school at Johnsburg Middle School on Tuesday, March 01, 2016 in Johnsburg. Baird placed second in the team's first tournament and hopes to continue his success this weekend at a Wisconsin Bow Hunters Club tournament at Chula Vista in Wisconsin Dells. 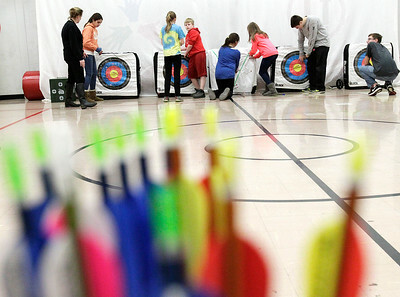 Matthew Apgar - mapgar@shawmedia.com Archery coach Erin Hiller watches as her students practice the bow and arrow sport inside the gymnasium at Johnsburg Middle School on Tuesday, March 01, 2016 in Johnsburg. Hiller was given a $3,500 grant from Safari Club International to begin an archery program at the school and will be headed to their second tournament of the year this weekend at Chula Vista in the Wisconsin Dells. 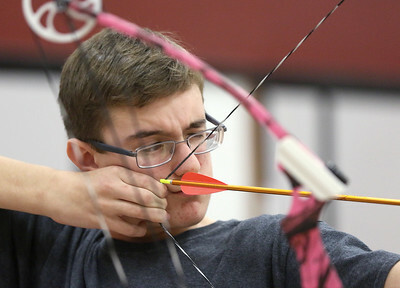 Matthew Apgar - mapgar@shawmedia.com Students practice archery inside the gymnasium at Johnsburg Middle School on Tuesday, March 01, 2016 in Johnsburg. The students, all beginners in the sport, will be headed to their second tournament this year, which will take place at Chula Vista in the Wisconsin Dells. 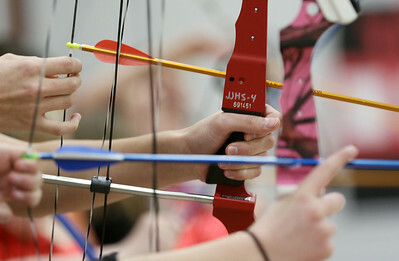 Matthew Apgar - mapgar@shawmedia.com Students rack their bows during archery practice at Johnsburg Middle School on Tuesday, March 01, 2016 in Johnsburg. The students, all beginners in the sport, will be headed to their second tournament this year, which will take place at Chula Vista in the Wisconsin Dells. 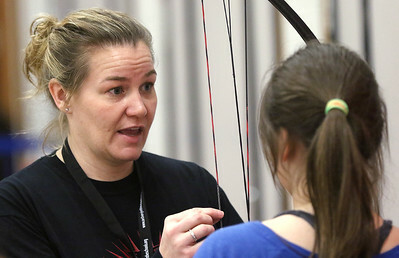 Matthew Apgar - mapgar@shawmedia.com Archery coach Erin Hiller talks with Abby Nowakowski during archery practice after school inside the gymnasium at Johnsburg Middle School on Tuesday, March 01, 2016 in Johnsburg. After becoming certified, Hiller was given a $3,500 grant from Safari Club International to begin an archery program at the school and will be headed to their second tournament of the year this weekend at Chula Vista in the Wisconsin Dells. 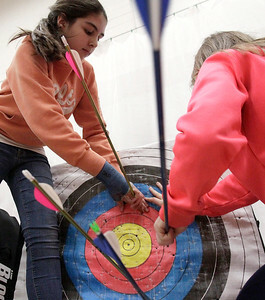 Matthew Apgar - mapgar@shawmedia.com Julia Pyles, left, and Piper Damien remove their arrows from a target during archery practice inside the gymnasium at Johnsburg Middle School on Tuesday, March 01, 2016 in Johnsburg. The students, all beginners in the sport, will be headed to their second tournament this year, which will take place at Chula Vista in the Wisconsin Dells. 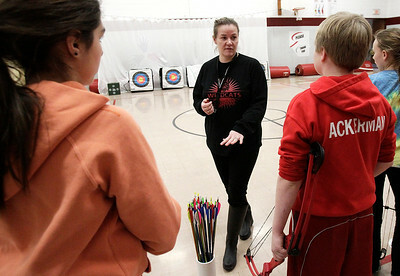 Matthew Apgar - mapgar@shawmedia.com Archery coach Erin Hiller talks with her archery team during practice inside the gymnasium at Johnsburg Middle School on Tuesday, March 01, 2016 in Johnsburg. After becoming certified, Hiller was given a $3,500 grant from Safari Club International to begin an archery program at the school and will be headed to their second tournament of the year this weekend at Chula Vista in the Wisconsin Dells. 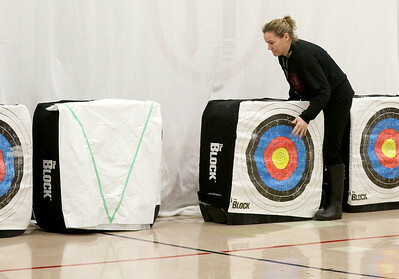 Matthew Apgar - mapgar@shawmedia.com Archery coach Erin Hiller sets up targets during archery practice after school inside the gymnasium at Johnsburg Middle School on Tuesday, March 01, 2016 in Johnsburg. Hiller was given a $3,500 grant from Safari Club International to begin an archery program at the school and will be headed to their second tournament this weekend at Chula Vista in the Wisconsin Dells. 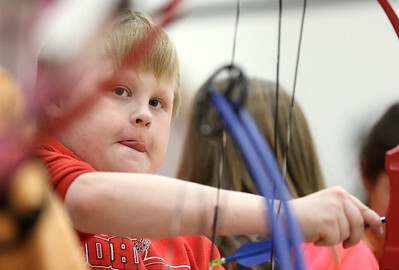 Matthew Apgar - mapgar@shawmedia.com RJ Ackerman loads his bow with an arrow during archery practice after school inside the gymnasium at Johnsburg Middle School on Tuesday, March 01, 2016 in Johnsburg. Ackerman and his teammates will be headed to their second tournament of the year this weekend at Chula Vista in the Wisconsin Dells. 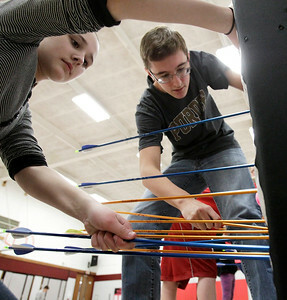 Matthew Apgar - mapgar@shawmedia.com Holly Schmid, left, and Nicholas Baird remove their arrows from a target during archery practice after school inside the gymnasium at Johnsburg Middle School on Tuesday, March 01, 2016 in Johnsburg. The students will be headed to their second tournament of the year this weekend at Chula Vista in the Wisconsin Dells. 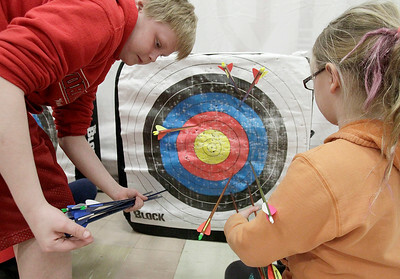 Matthew Apgar - mapgar@shawmedia.com RJ Ackerman, left, and Maddie Huhn remove their arrows from a target during archery practice after school inside the gymnasium at Johnsburg Middle School on Tuesday, March 01, 2016 in Johnsburg. The students will be headed to their second tournament of the year this weekend at Chula Vista in the Wisconsin Dells. 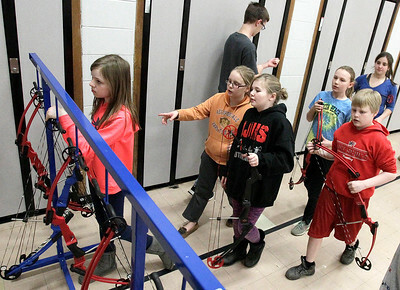 Students rack their bows during archery practice at Johnsburg Middle School on Tuesday, March 01, 2016 in Johnsburg. The students, all beginners in the sport, will be headed to their second tournament this year, which will take place at Chula Vista in the Wisconsin Dells.